Jerry is a handsome 1-year-old male French Bulldog. He was brought to us because he developed two large blobs of tissue at the inside corners of his eyes. 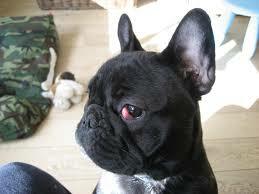 Jerry had “Cherry Eye” which is an inherited disorder of many breeds including bulldogs. It often appears suddenly and looks quite shocking when it happens. The actual name for Cherry Eye is Prolapse of the Nicitans Gland. The nicitans is that extra eyelid that dogs have under the main eyelids, tucked down by the nose. There is a tear gland in the nicitans that can pop out and result in a big red blob of tissue in the eye socket. The nicitans gland is important! It produces up to 40% of the tears of the eye and without it the eye can become chronically dry, painful and even foggy. Surgical treatment is aimed at tacking that gland back down into the eye socket and let the eventual scar tissue hold it in place forever. If the cherry eye is not repaired in a reasonable amount of time, the exposed gland becomes hard and an irritant to the eye. 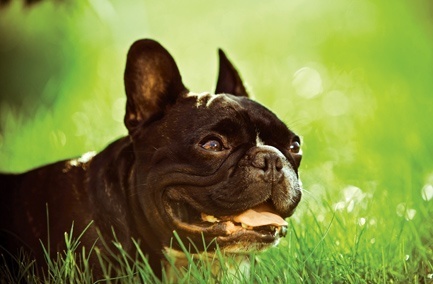 Since Jerry is a French Bulldog, anesthesia was carefully modified for safety and fast recovery. After the post-operative swelling subsided, his eyes looked normal and the unattractive pink tissue was gone. His glands continue to produce tears and are not going to pop back out.